Personalized Canvas Totes and Custom Photo Totes in Bulk. Promotional, Inexpensive, Budget Prices for USA, Canada. 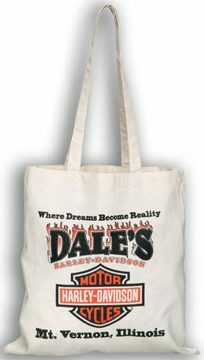 15'' W x 16" H cotton canvas tote, Natural color, 100% middleweight 7 oz. cotton, with 22" long (shoulder length). Maximum imprint area: 10" Wx10" H. Production Time: 5 days after art approval. Rush Production is available: contact us. Unit prices below include your 1-color imprint on one side. Add the amount shown for each extra imprint color. We also sell blank (not personalized) cotton canvas tote bags for $1.40 each (minimum quantity: 100). Additional Imprint location: please add $0.42 per cotton tote bag. Setup Charge: $40.00; No Setup Charge on Repeat Orders.